On Nov. 11, over 100 ETSU students, faculty, staff and Johnson City community members gathered around the fountain in Borchuck Plaza to remind others that they are not alone. 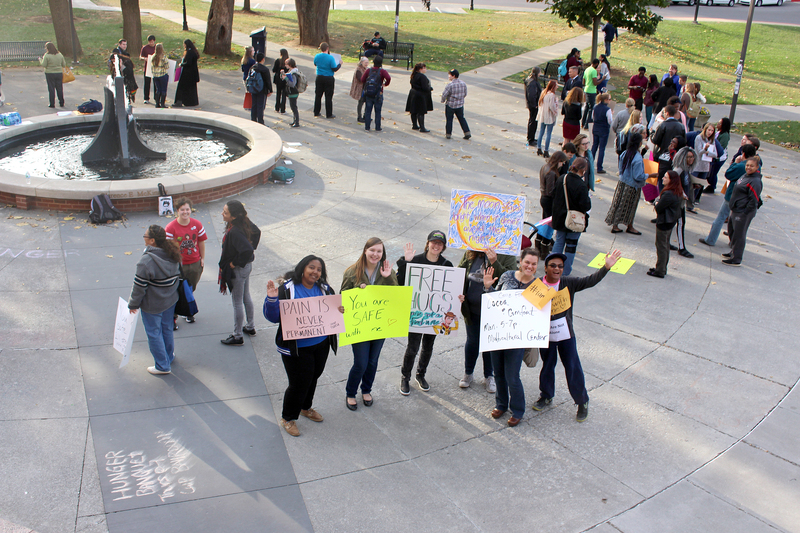 Angela Duggins, a graduate student studying storytelling at ETSU, said that the result of the presidential election inspired her to organize the demonstration. Duggins also said that there was an overwhelming amount of people who wanted to help their peers feel less lonely. “We decided to come together, and a lot of people joined us to show people that there are people who care and here they are and you can see their faces now if you ever need them,” she said. Duggins asked friends and professors to help spread the word about the demonstration, and a Facebook event was created. The event remained peaceful throughout and was not met with opposition or hostility. Rachel Walden, the director for ETSU’s medical library, said that as a faculty member it was important for her to remind others that they are welcome on campus. Heidi Armstrong, an ETSU student in attendance, was made aware of the fear that some people were experiencing post-election in her social psychology course. Armstrong said that she received an email about the event and made it a goal to attend the demonstration. “I am holding a sign that says: ‘I am safe. I am Christian. I am here,'” Armstrong said. She said her mission with her sign was to remind others that not every Christian is bigoted (wording?) and that she loves everyone. One student cried as she explained the reason why she was at the demonstration.